Want to quickly see how the open-source software Axis commerce works? You'll find a free and updated demo installation of Axis commerce here. We are currently updating the Axis commerce demo. Please check back shortly. There will be a new version up soon. 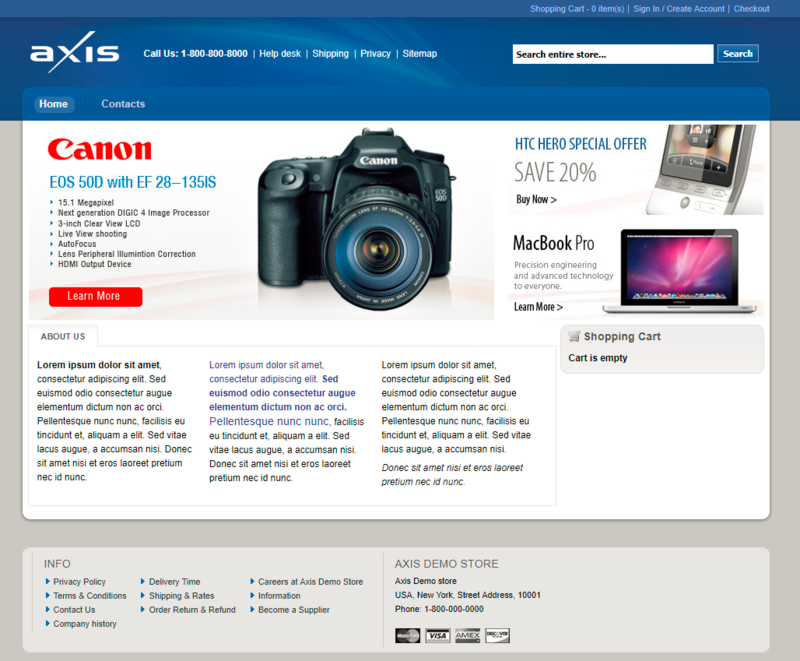 Axis commerce is a free open source ecommerce solution that comes with a lot of features. Some examples include manufacturers management, sales management, different payment methods supported and an Ajax admin interface for a great experience. You can create your own Axis commerce demo by downloading the files and going through the installation. The demo site will give more insight into what this ecommerce platform has to offer. You can customize the appearance of your Axis commerce demo using different themes and manage meta tags for better search engine optimization. The screenshots below will give you a preview of how a demo site looks like. The latest version available for download is 0.8.7.2 and was released on November 6, 2012.